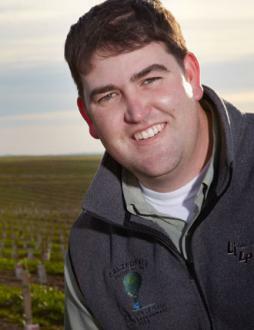 As Vice President of Orchard Operations for the largest olive oil producer in California, the California Olive Ranch, Adam Englehardt oversees nearly 10,000 acres of olives grown for olive oil, much of it planted for Super High Density (SHD) production. But his job is no typical “corporate” office position. One meeting with Adam and it’s clear that his depth of knowledge about farming comes from an education in agri-business from Cal Poly and an inherited love for the land. He is super knowledgeable about super high density farming, but more importantly, he seems to be driven by a very singular focus: creating the highest quality olive oil possible. Luckily, Englehardt has a tremendous advantage with all the resources of COR at his fingertips, but his passion for making the most of it is undeniable. In this brief interview, he touches on the path that got him to COR and the future direction that he’s clearly excited to be a part of. I’m a fifth generation farmer, so it’s in my blood. My family first got involved with olives in the mid-1990s, in an effort to diversify our farming. We considered grapes or olives, because our land was suitable for either crop, but the wine grape market was a bit uncertain at the time and water resources were limited. Olives were a part of the ranch’s history, as far back as the 1880’s, when they grew Mission olives for table and oil production. We found that many of the old trees were still viable for production, so we began by harvesting the original trees and then expanded the grove, gradually adding other varieties. I think the biggest challenge is teaching the American public to understand the difference between a quality extra virgin olive oil and the cheaper refined grades available on retail shelves - and to help them recognize that difference. I love the challenge of being on the cutting edge of a young and growing industry. It’s really exciting to me that we are breaking new ground all the time with better growing practices and finding ways to improve quality standards. Well, right now I’m focused on what we can do in the field to create a better quality oil by refining our fertilizer and irrigation practices. Our other big goal at COR is implementing a program to define better standard and provide some market enforcement for those standards. I like to vacation in St Helena in the Napa valley. Besides olives, I’ve always been interested in the wine industry, and with friends there, a trip to St. Helena becomes a little bit of both business and pleasure. There are two qualities that come to mind: resourcefulness and tenacity. About twice a week, my wife, Kim, and I make a very simple stir fry with whatever is fresh and ready from the garden. A little bit of roasted chicken sautéed in olive oil with leeks, onions, sugar peas, or bell peppers and set on a bed of couscous. It’s just simple, but it’s pretty fast and pretty good. I’d have to say the ranch I grew up on, Olivina, outside of Livermore in California’s central valley. It has, by far, been the development of the California Olive Ranch property in Corning. In less than a year, we developed 2200 acres with 1.6 million trees, using a super high density system. My wife and I took a trip recently and stayed in Seville, which is my favorite city in all of Spain. I can remember a dinner we had that was as memorable for the location as the food. Simple, southern Spanish fare of a roast chicken and a salad, but the view overlooking old town Seville and the old narrow streets was really something special. Right now, I’m concentrating on new farming practices to further refine super high density (SHD) olive production methods. I think what we are going to find is that we can further reduce fertilizer inputs while maintaining a consistently good yield. But, next on the horizon is that we are testing new varieties that have Tuscan flavor profiles, like Leccino, but that can be grown using SHD techniques. These new varieties have just released in the U.S. on limited basis, so it will be really interesting to see how they can perform in the field.